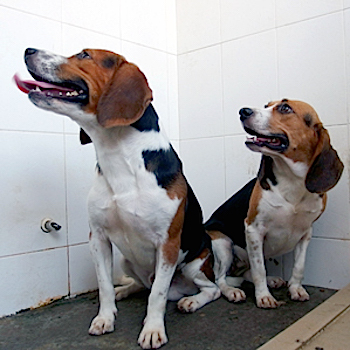 Gene editing has been used for the first time to produce customized dogs; Chinese researchers have created beagles with double the muscle mass by deleting a gene called myostatin. Genome editing refers to newly developed techniques that let scientists easily disable genes or rearrange their DNA letters. SF fans may recall the modded dogs in John Brunner's 1976 novel Shockwave Rider; they were genetically modified for higher intelligence, and were used to sniff out people who lie or use undesirable substances based on their body odor. "No need to be alarmed," the man rumbled... "Never met a dog like this before? You're in for an educational experience.